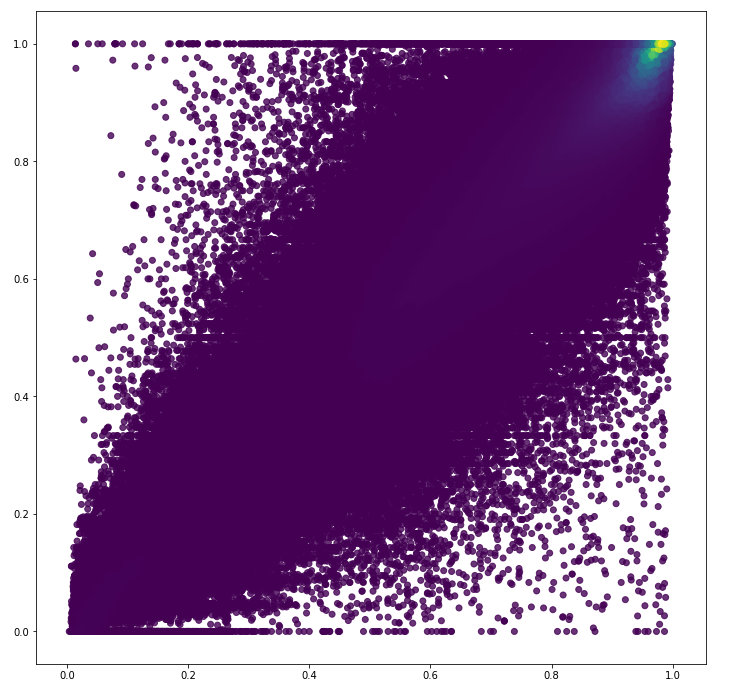 convolution of the gaussian kernel with a 2D histogram of the data. produces an essentially identical result. grid. Defaults to (400, 400). A (xmin, xmax, ymin, ymax) tuple of the extents of output grid. Defaults to min/max of x & y input. the same size as x & y. Whether or not to return the estimated density at each location. # for better memory/speed performance with huge numbers of points. # units as scipy.stats.kde.gaussian_kde's output. """Efficiently calculate the cov matrix of an image.""" Do you have an idea of how to make this code show a more smooth plot even when the vast majority of the points are in a small area? 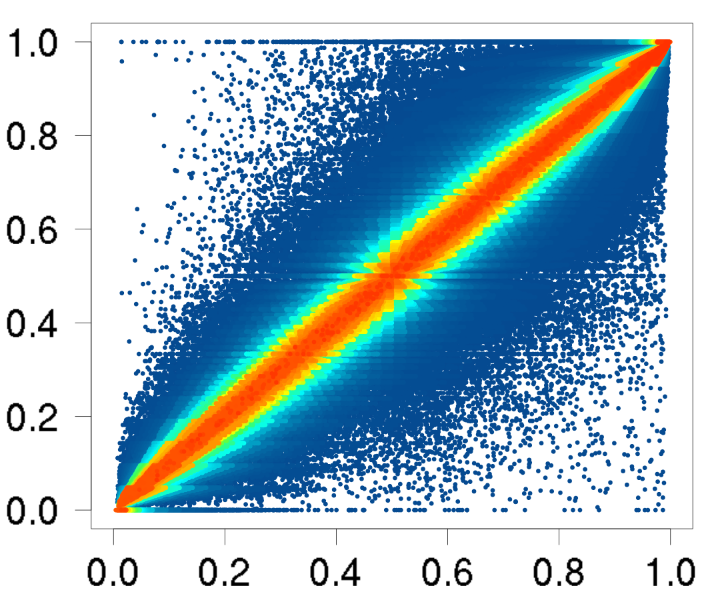 I would really like to be able to adapt this code to do more general density plots even in highly asymmetric data but I am not sure how to do that. Maybe by adjusting the weights or the cmap? @MikeDacre - Sorry I didn't notice your comment earlier! In that case, there's the correct way and then there's a shortcut. The shortcut is to just plot the log of the values. If you're not displaying a colorbar, that's the route you'll want to take. For example, plot ax.scatter(x, y, c=np.log(density), cmap='gist_earth_r') and you should get something that looks similar to the R plot. If you want to display a colorbar alongside it and still have the correct values, you'd want to change the Normalize type used for the color plotting. Something like ax.scatter(x, y, c=density, cmap='gist_earth_r', norm=LogNorm(density.min(), density.max())).